I came across We Are What We Are (Somos Lo Que Hay) this past summer; I found it to be a fascinating, multi layered, beautiful story. What is presented as the story of a family of cannibals is so, so much more. You can take this movie several different ways; you can simply watch a horror movie that does not rely on gore to tell it’s story, you can watch a horror story that also explores family relationships and dysfunction or you can really go all in and watch a horror movie that not only delves into family, but also into homosexuality and how it is, or isn’t, accepted. Written and directed by Jorge Michel Grau, this is the story of a family who has just lost their patriarch. Though the religion or backstory behind the cannibalism is never explained, we understand that this family performs a yearly ritual that is to be overlooked by the man of the family. Seeing as how the father has unexpectedly passed away, this responsibility is supposed to go to the oldest son, Alfredo (Francisco Barreiro). Unfortunately, this is a family with a mother who is slowly losing her sanity, a younger brother who has a quick temper and a sister who is clearly the “leader”, but can never be in such a masculine culture. There is an undercurrent of subtle disgust and disappointment towards Alfredo that does not make sense until a little later in the movie. Alfredo does not necessarily want to take the leadership role, but he cannot leave it to his impulsive brother, Julian, either. His sister, Sabina, has convinced him that he is more than capable of leading the family, so, Alfredo and Julian go out to find a suitable sacrifice. Their lack of experience leads to some bumbling and embarrassing moments while trying to abduct people. One unfortunate choice will even lead to another character’s brutal demise. As the time for the ritual grows close, the discord in the family intensifies; the only thing that everyone agrees upon is the fact that the ritual must take place. Just when Alfredo looks as if he is going to give up, a chance encounter on the subway causes him to reassess his life. Alfredo instantly owns his power, his new role in his family and his sexuality. As a gay man, Alfredo is looked down upon for his “flaw”. When he brings home a boy for the ritual, his mother and brother both use the F word freely and with much hatred. It is then that Alfredo finally snaps and has a heartbreakingly honest conversation with his mother about his sexuality. This movie was remade into an American and Americanized version with the gender roles all reversed. I have no shame in admitting that I prefer the original version. Why? Because this version is a slow burn horror movie that is more concerned with story; while there are moments of gore, they are reserved and well done. A lot of the violence in this movie is inferred rather than shown; I always find this to be a much more effective means of “showing” violence. All of us can identify and sympathize with complicated family relationships and we have all been touched by someone who is learning to be comfortable in their sexuality. I love that the social and cultural differences between men and women were shown and I especially loved that it was clear that the women were the strong ones. I had absolutely no idea that I would be watching a movie that had a message. Usually, I abhor a “message movie”, but this was handled with great care, respect, a fair representation of all sides and a non heavy hand. You can either see this side of the story, or you can ignore it. Either way, you will be investing in a family falling apart and doing only what they know in an effort to survive. Grau is not asking you to agree or disagree with any of the narratives or character arcs in this movie; he’s just illustrating a basic, human fact. 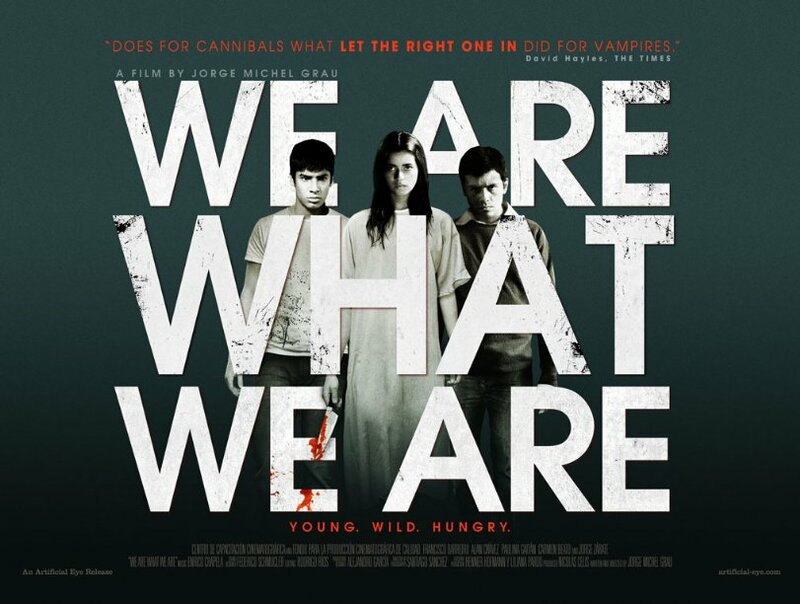 We are what we are.